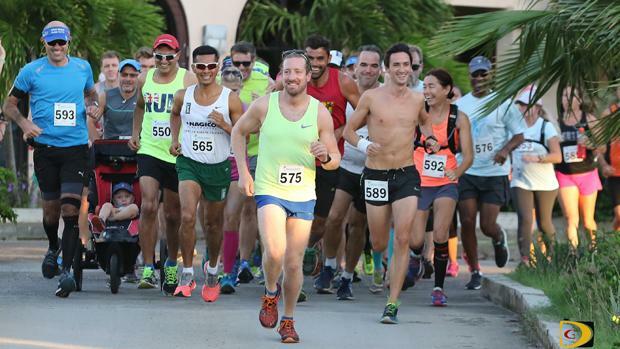 VIRGIN GORDA--For a moment during Saturday's 5th Virgin Gorda Half Marathon, Vincent Fournier thought he'd given home turf advantage to Tortola resident Ruben Stoby, who opened a sizeable gap. "The way this started out, I didn't think I was going to win it," said Fournier who covered the 13.1 mile hilly course in 1 hour 35 minutes and 24 seconds, with Stoby another 35 seconds back. "We were head to head then in those hills (going to Nail Bay) he took a big head start and I told myself, 'alright Vincent, if you follow that pace, you're going to die in the middle of the race' so I decided to try and do my own race and, try to catch up when it was flat again. But, he was so far ahead that I didn't think I'd catch up." Fournier said that eventually near the Coppermine Road on the southern end of the island he noticed he was making an inroad into Stoby's lead, which gave him a big boost. "Eventually I caught up to him, we ran together until Top of the Baths and I was like alright, I live on this island its time for me to give all I got for the rest and defend home turf and I'm proud," he said. "Even if I've only been here for six months." "I think the mistake I made was not to try to push it from there and I just continued and allowed him to catch me," Stoby explained, noting he was surprised to see Fournier in Copper Mine. "When I turned around, I saw him right there and for a runner, that can be psychologically challenging. We ran together for a little while, then he made a move just before the turnaround at the Baths and I failed to cover that. But, I'm not too disappointed because he's a good athlete. I wanted to win, but nevertheless, it's my second, second. I remember El Garrough (Hachim). He tried for the Olympic gold three times and he was expected to win and he didn't. just like that, I'm going to come back and hopefully win in on the third try." Maria Mays, sixth overall was the first woman crossing the line in 1:52.16 and said she was surprised to win after having a bug earlier in the week and she expected to feel awful. "But after the first mile, I didn't," she said. "I really wasn't on form and I thought I wasn't going to do it then I decided to go out, have fun and and enjoy it. I felt much stronger than I thought I'd be." Frequent visitor Ryan Blanchard of Richmond Va., who's getting married on Virgin Gorda this week, ran the race with his fiancé Andrea Sorlie. "It was a little hotter than last year l really liked the over cast last year," he said. "It's a great race. You can't beat the views. Whenever your legs start hurting, you just look out-doesn't take the pain away-but it takes your mind off it." He'd hope to finish in under two hours and did 2:13.10 and his fiancé, 2:35.46. "I ran it all last year but I walked up the big hills this time because I knew where they were," he said. Native Virgin Gordian Kilen Smith said she had been running two mile races and decided to tackle the 6 Mile Challenge as she'd never run that far before. "It was good," she said. after finishing in 1:18.03, before going to play with the Virgin Gorda Eagles in the BVI Volleyball Association championship game. "I thought it would have been a bit tougher, but for the first time, I think I did good."